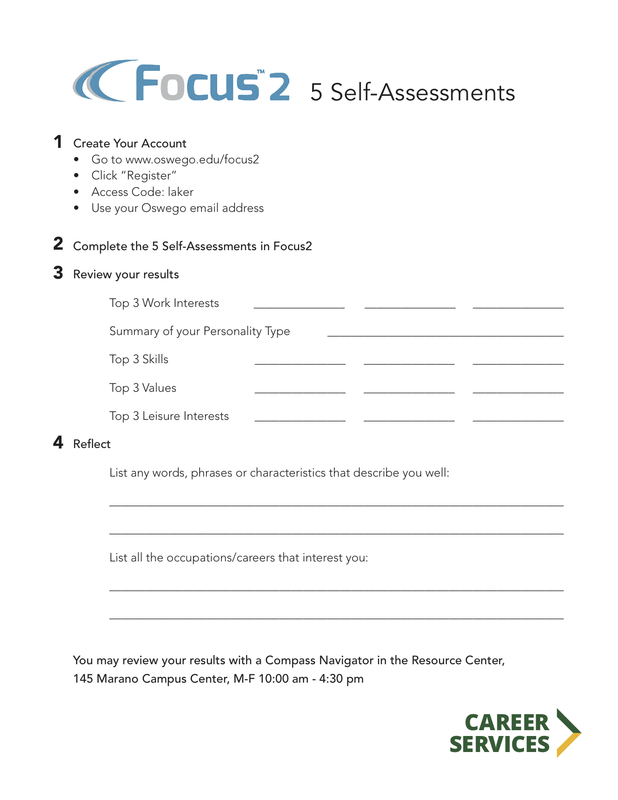 Self-assessment is the process of knowing yourself. We offer multiple inventories and assessments that provide you valuable information regarding your strengths, interests, and personality. 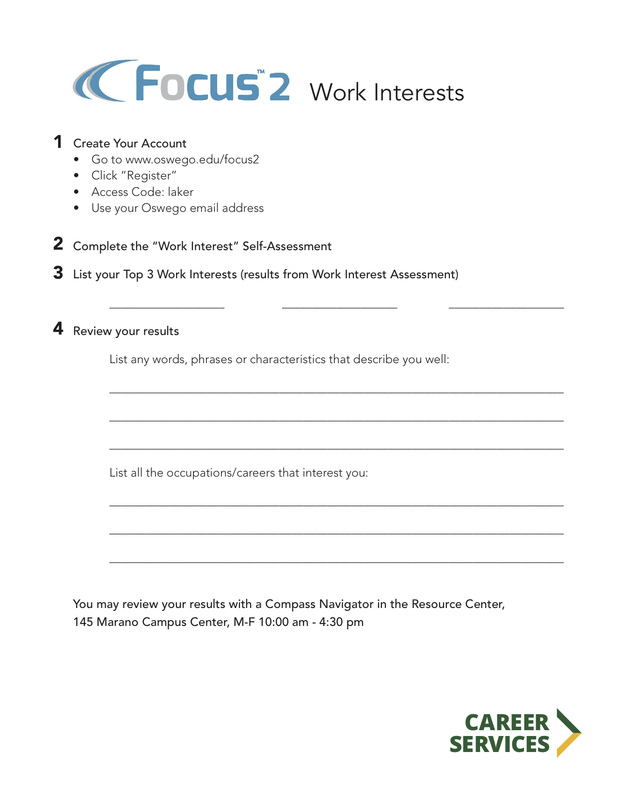 Focus2 is a web-based program that includes 5 assessments that will help you identify your work interests, personality, skills, values, and leisure interests. You can explore careers related to your interests and skills. To register visit Focus2. 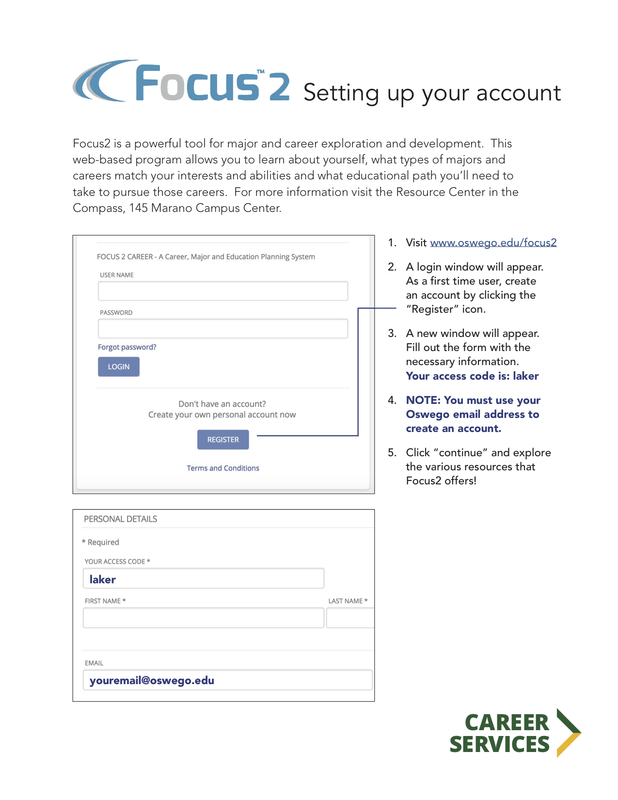 Use your Oswego email address and the access code laker to create an account. Instructions for setting up an account here. Register now and get started with the Work Interest Activity or the 5 Self-Assessments Activity. StrengthsFinder is an online assessment that identifies your “top 5” Themes of Talent. StrengthsQuest allows you to explore and strengthen your talents, use your strengths to improve your academics, discover a major and career path that builds off of your strengths and learn to use your strengths to excel. If you are interested in StrengthsQuest, email majorexploration@oswego.edu. Link to the StrengthsQuest site. Link to the StrengthsQuest Instruction Sheet. Myers-Briggs Type Indicator® (MBTI) identifies your preferences and provides information about your unique type (there are 16 distinct types). Understanding your personality type/preferences is the foundation of major exploration and this is a great tool for helping you to understanding who you are as well as what majors would be a good fit for you. The MBTI gives you information about how you orient in the world, take in information, make decisions and structure your life. View a sample MBTI Career Report. That will help you decide. If you are interested in taking the MBTI, email majorexploration@oswego.edu. The Strong Interest Inventory ® is a tool that matches your interests with majors and career fields. It helps you identify your interests, preferences, and personal styles and provides information you need to select a major and career you can be passionate about.View a sample Strong Interest Inventory Career Report. That will help you decide. If you are interested in taking the Strong Interest Inventory, email majorexploration@oswego.edu.